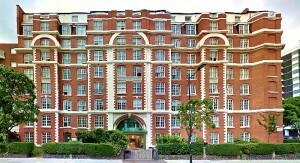 Rentrifone are very proud to be associated with the refurbishment of this highly prestigious London NW8 Mansion Block. The main feature of this refurbishment was a complete re-design of the very imposing entrance hall and reception area to include an integral Door Entry system with a colour video monitor installed into each apartment. The Mansion block falls within a conservation area and as such any proposed changes needed to be handled sensitively so as not to interfere with the original character of the building. The Managing Agents for this site were Lamberts, one of Central London’s leading residential Property Managers and Surveyors. 1. Door Access controller, to allow Residents keyless access. As can be seen in the photograph on the right the Entrance Panel fits in unobtrusively with the finished design. This panel is constructed to last many years and due to its inherent simplicity it will not date. To complete the installation Rentrifone installed 156 AGATA colour video monitors – one to each flat – plus a Porter Switchboard. The Porter Switchboard will allow the Duty Porter to communicate independently to each Resident directly from the Reception area. By working to a pre-planned schedule and also working closely with the Surveyors (Lamberts) and the main contractor, Rentrifone was able to complete its part of the refurbishment with the minimum of disruption to the Residents.